GnatMQ : a more community driven future ! When I developed the M2Mqtt library, a lot of people asked me to develop a .Net based MQTT broker as well. It wasn’t my initial intention but at same time I thought that it could be a good idea trying to reuse part of the M2Mqtt client in order to do that : this is the way how GnatMQ was born. From the beginning I said that it wasn’t a production ready MQTT broker with decent performance for its job but in the last years it turned out that a lot of developers started to use it for their IoT solutions. Due to my last really busy year and pushed by this issue opened in the GnatMQ repo, this week I decided to create a GnatMQ organization and making this broker more open source then before. I added some developers who asked me to be member of such organization so that they can drive the GnatMQ future better than me : this members proved to contribute to the project in the past pushing PRs on it. Of course, I won’t give up on that, I will always feel like the project’s father and I’ll coordinate such community. So … it means that GnatMQ isn’t dead … the community and the power of collaboration will move it to the next level, maybe having a really good fully .Net based MQTT broker ! 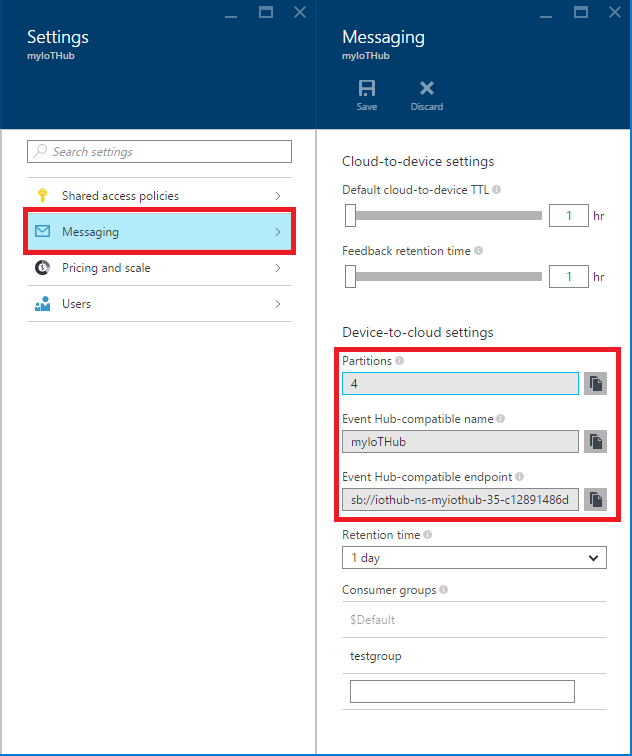 To complete the last two article series (data from device to cloud, command/feedback from cloud to device) on using AMQP protocol stack to interact with Azure IoT Hub, we need to get telemetry data from the devices. When devices send data through their D2C endpoints, these data flow into the IoT Hub system and are made available to the service through its D2C endpoint that is Event Hubs compatible which means we can use any Event Hubs client to get data from it. Of course, other than the above connection string we have to use the Event Hub compatible name. 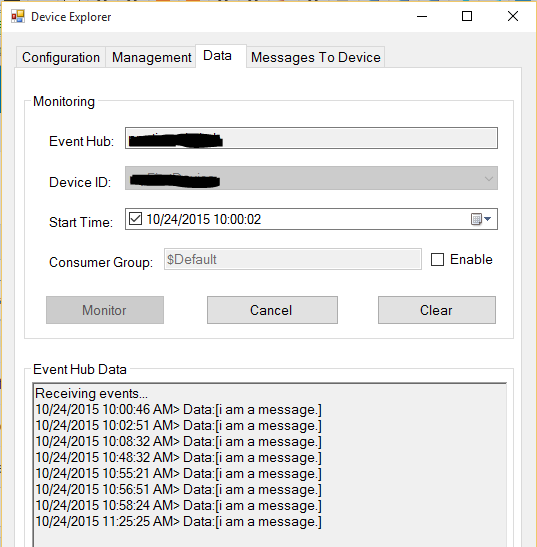 Now … how the get data from event hub ? What’s the code we have to write ? The simpler way to do that is to use the Event Processor Host provided by Microsoft as Nuget package that instantiates receivers for us on all available partitions and handle their leases providing us a checkpoint feature. The “only” big problem we have with this awesome software component is that it works only on .Net Framework so we can use it on PC based and Web based service applications. What can we do for UWP apps ? What we can do if we want to monitor telemetry data from an UWP app on Windows 10 without bridging data from a Web application ? As in the previous articles the solution is to use a good C# implementation of AMQP protocol stack as AMQP .Net Lite but in this case, to avoid AMQP stuff, we can use the Azure SB Lite library (available on Nuget too) that wraps the protocol stack and exposes same official Service Bus SDK APIs to access to Event Hubs (other than queues and topics/subscriptions). Without having the Event Processor Host available on UWP apps, the bid deal is to create one or more receivers on all partitions by ourselves and handling the checkpoint on what is the position inside the stream we have already read. In that case, it’s useful to save the last reading date/time and use it as offset for starting a new read on the stream. If you scaried to develop a monitoring UWP application because the related IoT Hub SDK doesn’t work on it … don’t worry you always have a solution that is based on using the underlying AMQP protocol stack. In that case, the solution is simpler thanks to the work I already done for the community with the Azure SB Lite. Of course, the choice to use and UWP application on a Windows 10 device instead of a .Net / Web application for monitoring your telemetry data is up to you and depends on the scenario, so it can make sense or not. 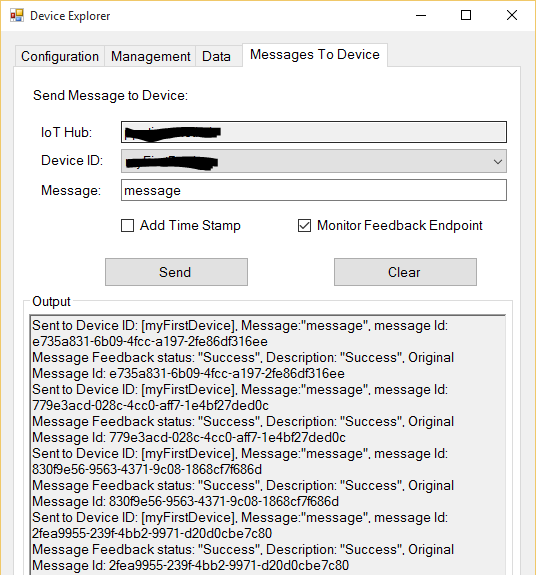 In the previous article, I described how it’s possibile to send telemetry data from a device and receive commands (sending feedback) from the cloud (to the device itself) using AMQP .Net Lite library connecting to the Azure IoT Hub. This approach is useful for some platforms that aren’t supported by the official SDKs like the .Net Micro Framework due to the Task and async/await programming model used in the C# implementation. You are right ! It’s true but … only if your service runs in a Web or a .Net Framework based application. If you try to install the above package in an UWP application you receive the following error ! As we can see, the official package uses some libraries that aren’t compatible with UAP like Microsoft.AspNet.WebApi.Core and Microsoft.Azure.Amqp. Tha latter sounds strange to me! It seems to be another AMQP stack implementation from Microsoft that can only run on .Net Framework. What are the differences with AMQP .Net Lite library? I’m sorry but I don’t know … the above stack isn’t open source and we can’t deep into it. However, there is a big and great difference that should be considered as a strength for AMQP .Net Lite : it works on all .Net platforms (micro, compact and full), on WinRT/UWP and Mono ! For this reason and using AMQP .Net Lite library we have a solution on developing an IoT Hub service inside a UWP application, a scenario that isn’t officially supported by Microsoft. As I love to say we can do that “knowing some AMQP protocol concepts and a bunch of IoT Hub node paths” ! At AMQP level the endpoints are accessible from different entity paths; if you know Service Bus queues, topics/subscriptions and event hubs we can think them in the same way. The authentication mechanism is the same as device side. In this scenario, we need to send two SAS token on the two different AMQP nodes for sending command and receiving feedback. Using the SenderLink instance the device sends data calling the simple Send() method and passing it a Message class instance contains the data to send. The sender link is created inside a new AMQP Session (using the related class of AMQP .Net Lite library) and the great news is that, thanks to the multiplexing feature of AMQP protocol, we can use the same session for both sender and receiver links all inside the same TCP connection. For more information you can refer to the previous article with a clear explanation of the message life cycle. Using the AMQP .Net Lite library we don’t have an Ack property on the Message class but we need to use the application properties collection at AMQP level. The Ack property (at high level) is translated in an application property named “iothub-ack” (at AMQP level) which can have the above possible values. If we don’t set this application property, it means the same as “none” value so no feedback. where <DEVICE_ID> is the id assigned to the device when we create it inside the identity registry. Finally, it’s importat to notice that the C2D endpoint queue can hold at most 50 messages. Using the ReceiverLink instance the service can receive feedback from the device calling the Receive() method. As for all examples related to my blog posts, I update sample from previous article on GitHub. Now you can find a simple console application and a UWP application that are able to send command to a device and receive related feedback. It’s clear that for a service running in a Web Application or .Net Framework based application, the best solution is to use the official Nuget package. With this article, I covered the NON officially supported possibility to use an UWP application to control devices through the IoT Hub thanks to the AMQP .Net Lite library and a bunch of AMQP paths. If you consider the great portability of this AMQP stack implementation, you could control your devices using a .Net Compact Framework app (on Windows Embedded Compact 2013) or … another device based on .Net Micro Framework ! Of course, using directly HTTP and AMQP protocols, we can access to the IoT Hub from other platforms (not certified yet) and it could be the scenario of the .Net Micro Framework because up to now there isn’t an official SDK for it. The current C# client implementation uses Task and async/await programming model very heavily that isn’t supported (yet) by the “little” child in the .Net frameworks family. One choice to connect to the IoT Hub from a .Net Micro Framework board is to use directly the underlying AMQP protocol without the abstraction layer provided by an SDK. In this case you need to know some protocol concepts and a bunch of paths to the IoT Hub entities used for communication between devices and Cloud. The purpose of this post is to show how to do this using the AMQP .Net Lite library that provides an AMQP protocol stack written in C# for a lot of different platforms like .Net Framework, .Net Compact Framework, .Net Micro Framework, WinRT (so UWP applications too), Mono, Windows Phone and so on; of course it’s available as open source on GitHub. that we can retrieve from the Azure portal after creating the new IoT Hub instance service. As for all the services inside the Service Bus family (queues, topics/subscriptions and event hubs) the IoT Hub needs an SSL/TLS connection for data encryption and server authentication; it means that we have to connect to the host address to the default AMQPS (AMQP Secure) port that is the 5671. We can create a new device inside the registry and get related credentials information using the Device Explorer application you can download here. After getting all needed information we can set them into the code. Using above information we can create an instance of the Address class and using it to establish the connection with the host thanks to the Connection class. and as for the previous entity you need to provide the <DEVICE_ID> in the path. IoT Hub offers a per-device authentication through a SAS token that we can generate starting from device id and device key. After connection establishment we need to send such token to a specific CBS (Claim Based Security) endpoint to authorize the access to the specific entity. The big difference is that the skn field is absent in our case using device credentials .To get the SAS token I used the same code from my Azure SB Lite library because it’s processed almost in the same way. The PutCbsToken creates a new session and a new link to connect to the specific $cbs node always using the same TCP connection. The content of the message is well defined by the AMQP CBS draft spec. After sending the token we are authorized to access IoT Hub from the device. Just a note : I’m using the Fx class provided by AMQP .Net Lite library to have the Format method that doesn’t exist in the String class for the .Net Micro Framework. Running the code, we can interact with the device using the Device Explorer application to receive the messages it sends. Using the ReceiverLink instance the device can receive command from the service in the Cloud calling the Receive() method. In addition to the sending commands features, the IoT Hub provides a feedback feature at application level for them; it means that the device is able to send a confirmation of received command to the service to accept or reject it. If the device is offline and doesn’t receive the command, the IoT Hub provides a TTL (Time To Live) you can set on every single message so that the command isn’t delivered to the device when it comes back online if the timeout is expired; this feature avoids to deliver a command that makes sense only if it’s executed on the device in a short time. The device doesn’t need to send the feedback as a message on a specific AMQP node/entity but it’s handled by the IoT Hub when the ReceiverLink accepts or rejects the command. Using AMQP .Net Lite we can call the Accept() or Reject() methods on the ReceiverLink instance; at AMQP level it means that a “disposition” performative is sent to the IoT Hub with an outcome of “accepted” or “rejected”. Receiving this outcome the IoT Hub sends a feedback message to the D2C endpoint on the Cloud service side. With such outcomes the message goes into a completed state (positive feedback to the Cloud) or dead letter state (negative feedback). Pay attention on the available Release() method in the library; in this case the outcome is “released” and the message returns into the command queue (enqueued state) ready to be re-delivered to the device if it calls the Receive() method again. If the device receives the messages more times and always calls the Release() method, the IoT Hub moves it into the dead letter state (removing it from the command queue) if the messages reaches the max delivery count; the same happens if the device doesn’t call neither Accept() nor Reject() methods and the TTL expires. Executing the code and using Device Explorer to send the command we can see the feedback from the device too. The full source code I showed in the previous paragraphs is available on GitHub and it has projects for .Net Framework (so you can test very quickly it on your PC), generic .Net Micro Framework (for testing on your real device) and a third project for Netduino 3 WiFi as example of embedded device. Of course, you can use any other board that support .Net Micro Framework and SSL/TLS protocol that is needed to connect to the IoT Hub. Other then Netduino 3 board, there are the FEZ Raptor and FEZ Spider from GHI Electronics (soon an example using them). Knowing some AMQP concepts and some node paths you can find in the official IoT Hub Developer Guide, we are able to create an IoT Hub client using whatever AMQP stack implementation that in this example is AMQP .Net Lite; you can understand that it’s what the official IoT Hub client does creating an abstraction layer on top of it. In this way we can add any other platform (not officially supported) like the .Net Micro Framework to the set of available devices for our Internet of Things solution based on IoT Hub.